In this world of Digital literacy, Education needs to step up to capitalize on Artificial Intelligence and maximize the learning resources for people from all regions. The only way we can internalize the entire society is through giving them access to state-of-the-art technology and help them figure a way in this reality. SpaceTrove comes with a free of cost gaming experience integrated with learning in Space Technology which anyone can play from any device around the world - making it a space of the people, by the people and for the people. Team SpaceTROVE's challenge is to create Virtual Reality experiences which enable public relate with Moon and Mars. We created an Online Multiplayer game using Unity 3D game engine which allows players to play this from any device. Interactive Learning using actual 3D maps of Mars from NASA Database helps making Learning more Fun for players. 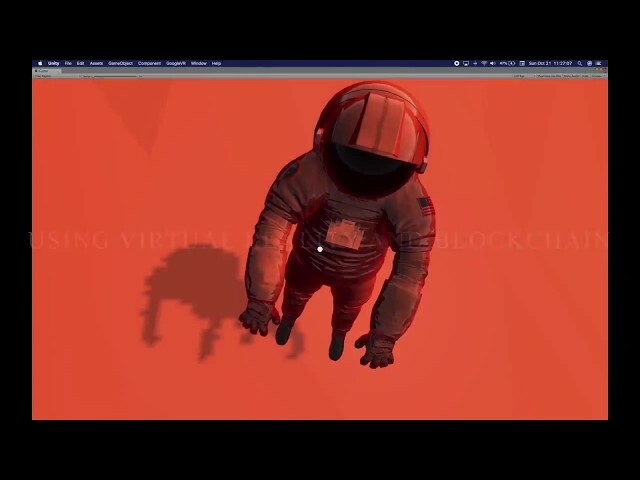 In this Open World game, players are prompted to invest on certain locations on Mars using ERC-721 tokens. They make this investment to secure a place for their survival for a time when Earth becomes uninhabitable. They use these trove tokens for improving their rovers, investing and exchanging with other players. This barter-like exchange helps them receive a unique experience of civilization development. Throughout every location on Mars in the game, there are visuals which tell the player about actual data of that location. For example: Gale Crater on Mars has found evidence of water and an ancient freshlake water body. This information prompts the player to invest his Trove tokens on Gale Crater because s/he could survive with this usable water on Mars. Earth and Spacetrove's future depends on you. Visit our website and Github project site and support us in our journey as we try to give people the ability to relate with with space and dream about Intergalactic travel. We can all relate with Wall E and Star Trek, but it is time that people learn to relate with the feeling of being an astronaut on Mars, on any day from their homes! In a world where people have a hard time to bridge the economy gap, SpaceTROVE aims for Mars and Beyond, so that even if people fail to reach that, they can reach the moon. But in originality, we want to generalize Artificial experience by making this the most accessible game in Virtual reality for people from all age groups. At the same time, they learn about space, discoveries, investment and basic mathematics. The prompt of Space Trove asks individuals to colonize Mars when Earth becomes uninhabitable. So as the game progresses, people learn about civilization of Earth, how to expand on invested regions of Mars and actively chat and communicate people (irrespective of class, race and gender) in the SpaceTROVE ecosystem. Using technology is generic, using latest technology with an entertainment factor incentivizes the underprivileged to find fun and commonality in tech, the same way as the mainstream society. One app cant change the entire economy overnight, but we can take the most important step of Space Tech and Artificial intelligence IF you provide us the opportunity to ensure our access and platform for all using SpaceTROVE.